The Lesser Spotted Eagle is a large Eastern European bird of prey. Like all typical eagles, it belongs to the family Accipitridae. The typical eagles are often united with the buteos, sea eagles and other more heavy-set Accipitridae, but more recently it appears as if they are less distinct from the more slender accipitrine hawks than believed. This is a medium-sized eagle, about 60 cm in length and with a wingspan of 150 cm. Its head and wing coverts are pale brown and contrast with the generally dark plumage. The head and bill are small for an eagle. 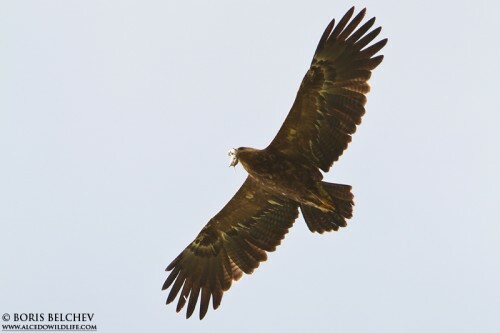 There is usually a white patch on the upperwings, and even adults retain a clear-marked white V on the rump; the wing markings are absent and the white V is not well-defined in the Greater Spotted Eagle. The juvenile has less contrast in the wings, but the remiges bear prominent white spots. It differs from Greater Spotted Eagle juveniles by a lack of wing covert spotting and the presence of a cream-colored neck patch. The call is a dog-like yip. The birds formerly considered to be the resident Indian subspecies are now considered a separate species, the Indian Spotted Eagle (Aquila hastata), quite distinct and readily separable by morphological, behavioral, ecological and DNA sequence data. The European taxon is actually closer to the Greater Spotted Eagle; their common ancestor seems to have diverged around the middle Pliocene, perhaps some 3.6 million years ago (mya), from the ancestors of the Indian birds. The "proto-Spotted Eagle" probably lived in the general region of Afghanistan, being split into a northern and a southern lineage when both glaciers and deserts advanced in Central Asia as the last ice age began. The northern lineage subsequently separated into the eastern (Greater) and western (Lesser) species of today, probably around the Pliocene-Pleistocene boundary not quite 2 mya. The spotted eagles as a group are quite distinct from the typical members of Aquila, the "true eagles". The present species hybridizes occasionally with the Greater Spotted Eagle. Hybrid birds are almost impossible to identify if not seen from up close. The Lesser Spotted Eagle breeds in Central and Eastern Europe and southeastward to Turkey, and winters in Africa. This is a very wary species of open or lightly wooded country, in which it hunts small mammals and similar terrestrial prey. This eagle lays 1–3 white buff-spotted eggs in a tree nest. As usual for eagles, only in breeding seasons with very abundant prey does more than one young fledge however: the female starts incubating when the first egg has been laid, and thus the first young to hatch usually outgrows its clutchmate(s) and will kill and even eat them sooner or later.